A quality brake can be one of the best investments you make for your gutter contracting business. Being able to bend materials on the jobsite can save you valuable time and money. When making a large purchase it is important to consider which features you will need. Finding the perfect fit for your business will ensure that you’re left with a product you are happy with for years to come. Throat Depth – Make sure the brake system you choose has the throat depth needed on the jobsite. The Mark I, II, and IV Series each have a throat depth of 14” which allows for more custom bends. Easy Adjustment – An important aspect of any large machinery is how easily it is adjusted. Especially for a one-man job, being able to quickly adjust for each bend is critical. 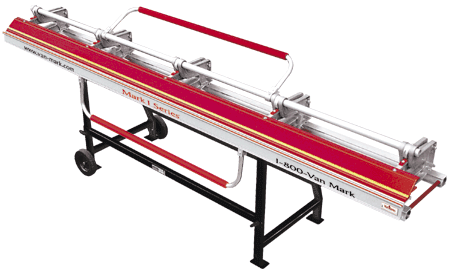 Van Mark promotes that their brakes never need adjusting but include independently-adjustable UHMW plastic wedges when the need arises. Bending Power – Both the bending capacity and bending power of a brake are essential features to consider. The Mark II series features POWERslot technology offering greater bending power with less force making for a smoother, better end-product. Durability – Durability is often determined by the type of raw materials the brake is constructed of. Using quality materials and a construction that is built to last will ensure your system will be dependable for the long-term. Portability – You don’t need to sacrifice the portability of a system for better quality. In fact, there are many brakes available on the market today that are both durable and lightweight. A lightweight system with handles makes for easier transport from jobsite to jobsite. Maintenance Needs – Servicing a brake system can take a lot of time and energy. Brakes with minimal parts require less maintenance and repair needs, allowing you to stay on the jobsite and working. Commercial vs. Residential – Do you need a brake that will work for both your residential and commercial needs? Both the Mark I and the Mark II come in commercial and contractor models and feature dual locking, bending handles. The alloys and tempers of metal vary, resulting in a wide variety of bending capabilities. For further questions on specific metals, contact our team at 1-888-909-RAIN (7246). 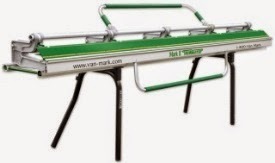 At GutterSupply.com we are proud to carry Van Mark brand brake systems and accessories including the Mark Series. Van Mark has been a worldwide leader in the brake industry, producing not only a superior product, but also making the job of the contractor easier. To learn more about the features of each brake system we carry, visit us here. You can also view our selection of quality brakes in our product catalog.